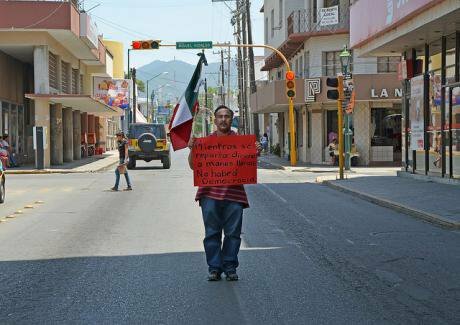 One-man protests in Mexico against corruption. The banner says:"as long as money is handed out, there will be no democracy." Armando Aguayo Rivera/Flickr. Some rights reserved. This article belongs to our series "Mexico at the 2018 crossroads" coordinated by Gema Santamaría, Alejandro Velez and Francesc Badia. When the curtain came crushing down on Javier Duarte’s reign over Mexico’s Gulf Coast state of Veracruz, what emerged looked an awful lot like a 101 for state capture. Duarte, the entity’s governor from 2010 until he fled an arrest warrant last year in October, and his inner circle of coconspirators had perfected it. Streamlining institutions of all branches of government, which proved readily available tools to serve criminal interests situated within and without the state, a sum no smaller than 1.75 billion U.S. Dollars of public funds was embezzled while scrutiny, let alone prosecution, was successfully impeded. Most media, international and domestic alike, have since fallen into a narrative dangerous in its reductionism: that of a deviant strongman on a rampage for personal gain, as manifest in prime real estate purchased anywhere from Madrid’s Parque del Retiro to Houston’s affluent suburbia. An agenda, recent reporting by The Economist seemed to suggest, unacceptable even by standards of the PRI, Mexico’s grand old Institutional Revolutionary Party, which governed the country uninterruptedly for 81 years until 2000 and currently controls the presidency as well as most of the country’s federated entities. Duarte’s apprehension on April 15 – by Guatemalan authorities who would later remark upon their Mexican counterparts’ inertia – gained the federal government the paper’s praise. It read it as an indication that “tolerance [towards political corruption] is waning”. Most media, international and domestic alike, have since fallen into a narrative dangerous in its reductionism: that of a deviant strongman on a rampage for personal gain. A high-level perpetrator behind (Mexican) bars would be a first step. At best. For whether an eventual trial, following an eventual extradition, will do more than assign individual blame and instead help decipher networks of perpetrators depends on federal authorities’ and thus the PRI’s willingness to go down the rabbit hole. The likelihood of that happening approaches, by all indications, zero. For at its end await uneasy questions. As to why the federation stood idly by as Duarte looted Veracruz. And, on a systemic scale, as to how the country’s flawed democratic transition and the virtual absence of effectual checks and balances has procreated the most blatantly corrupt breed of (PRI) governors yet, of which Duarte is but the more spectacular specimen. Far more likely appears, as the 2018 presidential campaigns are picking up steam, Duarte’s transformation into a political football. Attempts to that effect are, to be sure, well underway, with attacks invoking collusion between Duarte and, of all, Andrés Manuel López Obrador, the left-wing personified electoral nightmare causing sweats for the PRI and the conservative National Action Party (PAN) alike. But even if Mexico’s prosecution services defy overwhelming odds of politization and showcase that their freshly gained independence is worth more than the paper it’s printed on, the clarification of Duarte's financial crimes would capture but a fragment of the regime of terror he and his predecessor and political foster-father, Fidel Herrera Beltrán, have unleashed on Veracruz’s population over the past 12 years. Ask Belinda, a forty-something-year-old woman who has made the search for her disappeared son – and closure – a full-time profession, and a clearer, albeit far darker, account of what corruption does on the ground starts to impose itself. By the time we discussed her plight, she had abandoned a lucrative medical practice. Instead of surgical instruments, she was now handling 9-foot-long poles, sticking them down into the soil of one of Veracruz’s countless clandestine burial sites to bring it back up and detect the smell of decomposing bodies, never knowing whether it might stem from her child or somebody else’s. In her voice, and that of other activists-by-necessity-and-pain I talked to during a months-long investigation in Veracruz, the default media designation of such sites as “narco-cemeteries” met incomprehension, and anger. A misrepresentation that is letting off the hook the government all too easily, according to them. For many of the up to 20,000 disappearances victims’ organizations say Veracruz has racked up trace back to perpetrators in uniform. Ask José, who thought he might actually do good as a state police officer but saw his role mutate into what he described as a halcón, or criminal lookout, in a matter of weeks on the job, and the division between state and organized crime fades away. Elements non-compliant with the bosses’ agenda, ranging from spying on federal operations and the non-intervention into cartels’ affairs to forced disappearances, extralegal killings, and kidnapping-for-ransom, he said, were subjected to torture. Some of his peers were also redeployed to areas where death was to be expected. Ask him how security institutions served criminal masters with or without neckties, and anything but the law. For many of the up to 20,000 disappearances victims’ organizations say Veracruz has racked up trace back to perpetrators in uniform. Ask any local journalist trying to do their job, and stay alive regardless, in the Western hemisphere’s principal killing field for media professionals, and find that Veracruz is lard with zones of silence violently and continuously imposed by the dozens of non-state armed groups that keep on carving out their very own thiefdoms, strongmen inhabiting the grey between the legal and the illegal, or coalitions hereof. And then ask either federal or the new Veracruz state authorities, run by the PAN since December 1st 2016, what steps are being taken to tackle any of these issues, and you will harvest emptiness. Safeguards that could help prevent the repeat instrumentalization of public institutions for criminal ends include strengthening officers’ rights against superiors’ coercion and abuse and obligating security forces to keep tight and publicly accessible operational logs so as to hinder their back-to-back involvement in crimes against humanity. In a discursive field of party-political dirt-throwing, however, these items do not even surface. As it stands, then, nothing indicates that a pump has been, in any significant way or shape, taken to the authoritarian-criminal swamp that is Veracruz’s state apparatus. Alas, Veracruz merely provides a glimpse into what thrives, both on the federal level and that of federated entities, behind the façade of Mexico’s nominal democracy. Barring a miracle, evasive inaction, or opportunistic action, must also be expected to provide the groundwork for organized criminals and colluded politicians to renew their vows during upcoming elections, including those for president. True safeguards against illicit campaign financing, or the installation of docile candidates, both documented widely and persistently during past polling exercises, are, again, absent. Barring a miracle, evasive inaction, or opportunistic action, must also be expected to provide the groundwork for organized criminals and colluded politicians to renew their vows during upcoming elections. A glimmer in the dark to cling onto is, still and all, provided through self-sacrificing civil society organizing born out of traumata and the quixotic struggle for justice. When the state moves, experience has shown, it is because its hand is being forced from below by inconvenient and nagging voices of the likes of Belinda. The best bet for anyone seeking to contribute to such a thing as change in Mexico is to foster these experiences. Through direct, unfiltered assistance to support their work, and by spreading their voice. Or, of course, by reminding foreign governments not to shy away, in the name of economic interests, from a frontal discussion on the true scope, levels, and effects of corruption and state-criminal collusion.